At Holmsdale we have lots of pets! We believe that spending time with animals is important to help children develop an understanding of how to treat other living things. They also help children begin to understand the need of all living things for water and food among other things. Most importantly, the children love to spend time watching, handling and caring for the animals. Two donkeys, Hettie and Bullseye, who we adopted from the Donkey Sanctuary. Lots of chickens, who give us plenty of eggs! Giant African Land Snails (GALS). 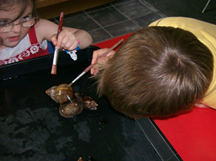 They like to sit in a little warm water and have their shells cleaned with paint brushes- see the photo! During the last few summers, the children have enjoyed watch ducklings and chicks hatch, either after incubating them in one of the classrooms, or letting the chickens sit on the eggs! The chicks and ducklings visited other rooms and were extremely popular! During the spring the children like to watch as frogspawn from our pond slowly changes into tadpoles, then froglets, then finally frogs, which we release in our orchard! 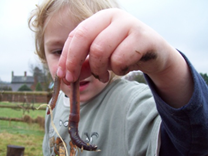 We also take opportunities to learn about animals around us, for example going on bug hunts at Forest School. Worms, slugs and clusters of ladybirds often cause lots of excitement!